The NFFF Training Academy was established in 1976 in an effort to help raise, develop and progress the standards within the fish and chip industry. In that time we’ve welcomed thousands of students through our doors learning the theory and practical skills required to start up and run a successful fish and chip shop. As a federation we feel fish and chip training plays crucial role in running a successfull business. Some of our key trainers today were NFFF students themselves once, who have since gone on to run successful award winning fish and chip businesses. What NFFF fish and chip training offers? Award winning guest friers able to show you how they do it to win! Want to be taught by industry professionals? All our NFFF trainers owners and operators are from award winning fish and chip shops. With years of experience our trainers are on hand to pass on their valuable knowledge and experiences. They provide independent advice with the aim to see your shop succeed. The NFFF Training Academy has academies based in Leeds, West Yorkshire, England and in Kilkeel, County Antrin, Northern Ireland. Both offer fantastic facilities which are bright and modern which helps further enhances the learning experience for the students. If you are unable to travel to Leeds or Kilkeel we can also come to you with the NFFF In Shop training course. Developed in conjunction with Seafish, this course is ideal for those who are new to the industry, whether you’re buying your own business or managing a business for someone else. This course teaches the theory plus lots of practical skills and also includes the opportunity to sit the Level 2 Food Safety in Catering and/or Health and Safety in the Workplace exams. This course is designed for those with some previous catering experience but no practical knowledge of fish frying. The syllabus will cover the practical elements of the business. 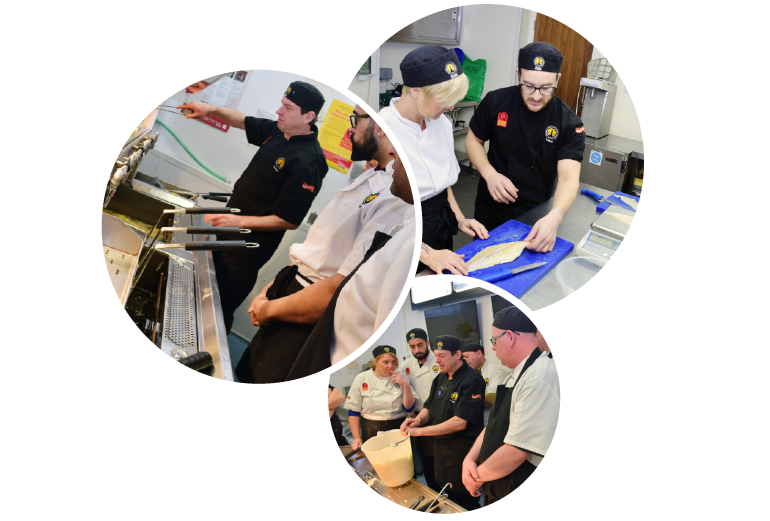 Held at our fully equipped Training Academy in Leeds, this is the perfect course to introduce you/your staff to the best techniques of the fish frying process. You will also get the latest industry information and increase your industry awareness. Bespoke training tailored to your requirements. An NFFF approved trainer will conduct six hours of training at your fish and chip business, at a date and time that is convenient to you. Adopting this approach means that the trainees can be taught in an environment that they are used to working in, with machinery and equipment that they feel comfortable with. 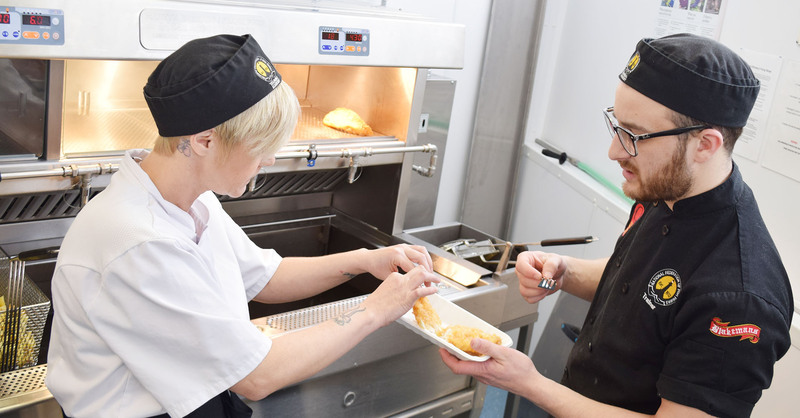 Another benefit of a fish and chip shop undertaking in shop training is that they can request for the approved trainer to focus on specific areas within their business. Interested in training, select the course which best suits you and book today. If you have any questions you can visit our Frequently Asked Question page or please get in touch with the NFFF Head Office on 0113 230 7044 or email training enquires. All trainers were brilliant, very informative and answered lots of questions. Great to receive training from current fish and chip shop owners.Tony Postlethwaite, Priory Plaice. This was a one of a kind course. It took me through all aspects of owning and running a fish and chip shop. Exceptional trainers.Catherine Jones, Mammo's. Fantastic course, very professional and easy to understand. Every member of staff was amazing.Daniel Lewis, Swallow Nest Fish Bar.